These are replacement brand new geniune Apple iPhone 3G Digitizer Touch Screens. The Digitizer Touch screen is the component that gives your iPhone it's awsome touch sensitivity. The iPhone touch screen are commonly and easliy damaged or scratched through accidental bumps or just normal wear and tear. Replacing your iPhone Digitizer Touch screen is a simple and easy way to get you iPhone looking and working like new again. 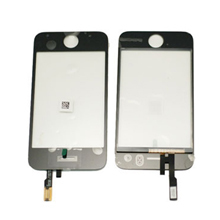 These Digitizer Touch Screens are only compatible with the iPhone 3G, they are not compatible with the iPhone 3GS.